Having lived on the Florida Gulf Coast for many years, my family became used to spending a lot of time outdoors in the pool or on the beach. Now that we live in rural Georgia, the ocean has been replaced by the lake but we still spend a lot of time in the pool. Whether you are playing in a backyard sprinkler, splashing around in a kiddie pool or taking the boat out to the lake there are some things to consider when gearing up for summer water fun and water safety. It’s important to remember that water at any depth can be dangerous to kids. Learning to swim is paramount in water safety. All of my children and grandchildren learned to swim while they were still in diapers, and I have always been a believer of getting the kids swimming lessons from a professional. Having a pool in the backyard is so convenient and lots of fun, but also brings with it a lot of responsibility which is something I don’t take lightly. I think it’s important to set water safety rules for the whole family, based on swimming abilities. For example, inexperienced swimmers should stay in water less than chest deep. When my youngest grandchildren are over we make sure they are always supervised and wearing appropriate flotation devices such as Stearns Puddle Jumper life jackets. My older grandchildren are fabulous swimmers, but even they know it’s a rule to always swim with a buddy. When you are swimming in an area away from home, it’s important to choose a location that is supervised by a lifeguard and to read and obey all rules and posted signs. Especially during the hottest months we never know when a thunder shower is going to creep up on us, so it’s important everyone knows the get inside at the first sighting of dark clouds, thunder or lightning. Something I have to remind my teenage granddaughters is that no matter how dark their tan might get this summer, it’s important to always wear sunscreen. Also, stay hydrated and come inside if they start feeling too hot or too cold. When having fun in the water this summer, it’s important to remember that kids don’t float. I know those chubby little toddler legs might look like they’d float, but seriously please be sure your kids are wearing flotation devices that will keep their head above water at all times. Stearns Puddle Jumper Life Jackets and Suits are designed to keep your child’s head above water. Stearns Puddle Jumpers suits are easy to buckle on and off for potty breaks and diaper changes. 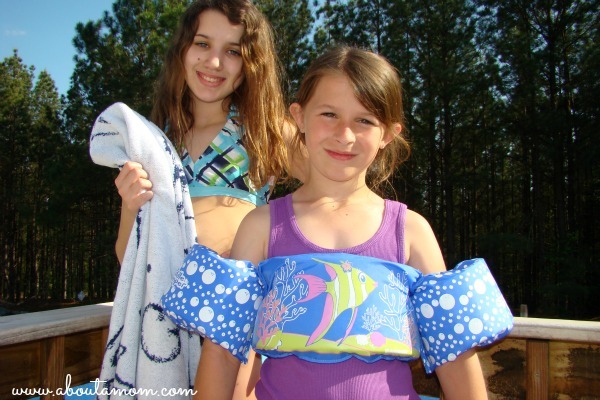 Stearns Puddle Jumpers Life Jackets will keep kids safe and give parents peace of mind while having fun at the pool, lake, or beach this summer. They are available at Target and Walmart. Be sure to check out the Stearns Puddle Jumpers “Fun in the Sun” Sweepstakes on the Parents Magazine Facebook page! Click on the “Fun in the Sun” tab and enter for a chance to win $5,000 to use toward an ultimate summer vacation. Additionally, three first-prize winners will win their choice of up to 2 Puddle Jumpers. This is a sponsored post written by me on behalf of Stearns® Puddle Jumpers®. The opinions and text are all mine. So important to follow all safety rules when you are near water – Every year there are some terrible accidents. I am always around whenever my kids are in the pool, keeping an eye on them and making sure there are no mishaps. I could not agree more! My husband and I are always very serious when it comes to “water rules” and it has transferred to our daughters. Living in the land of lake and having a cottage on the lake it is so important! That looks like so much fun! We are still getting snow here….hopefully soon the warmth will come out and we can go swimming again!! Water safety is so important! I agree with all your tips. It is so crucial that kids learn to swim, and have safety devices for those that are younger. Watching sun exposure is also a very big one many don’t think about. The sun reflects off the water and you can get burned a lot faster while in the water, and more severe in a lot less time and not even notice it because of the cooling sensation of the water. Great ideas about pool safety, basing them on ability. My parents have a pool and we have kids (14 and 3) so they definitely have different sets of rules. Sunscreen for everyone no matter what too, I am a melanoma survivor! Water safety and knowing how to swim is paramount. Thank you for reminding us. Your pool is beautiful, too! Great tips, especially about swimming with a buddy. These life jackets look like they are really great quality. I will have to pass the name on to my brother who has younger kids. Thanks! These are such great and important tips. Swimming is a great way to cool off, but it can also be dangerous if you don’t follow safety rules. Great tips! I agree with it being so important to make sure to teach your kids to swim. It’s one of the most important skills a person can learn IMO. I love that this swim aid has a strap to keep it in place! These are all very important tips and I hope all parents and children will abide by them when swiming or near water. We are careful of the sun…we also need to take swimming lessons here! Water makes me nervous, so I would definitely appreciate that extra little bit of security. Of course, monitoring is critical, but this is peace of mind, like you said. Since both of our kids are still learning how to swim they always have their Puddle Jumpers on when around water. Even at the beach. They love the confidence they feel when they wear their PJs and enjoy the water even more. Me? Well I have peace of mind! We are graduating from splash pad to pool this year. Thank you for the safety info! Great tips! Pool and water safety are so so important! 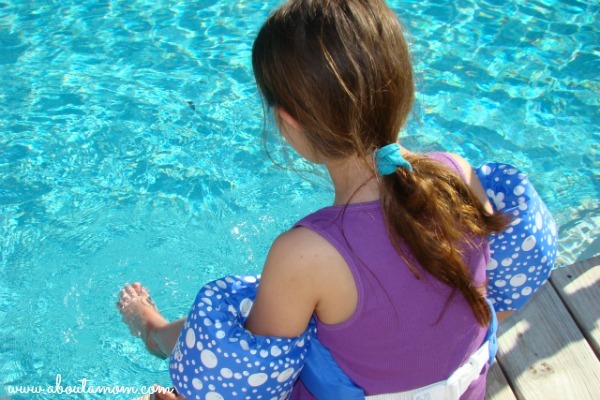 We go over pool safety every year since grandma has a pool! That little floaty/life jacket thing is great! That would be perfect for my 5 year old who is still learning to swim! Living in Arizona, water safety is a big deal for us because we swim all the time with this heat! Thanks for sharing! My little guy loves his Puddle Jumper. hahaha “those chubby little toddler legs might look like they’d float” <– best line ever. But yes, you are right, water safety is crazy important. I think it's one of the biggest things I take seriously next to car seat safety. I am a big advocate for swimming lessons. My oldest son has autism and drowning is one of the major causes of death in the autistic community. Many children, not just autistic children, are drawn to water and it can be very, very dangerous. Water Safety is definitely nothing to play around with. I can’t wait to take M into the water!!!!! My son doesn’t know how to swim, but he will be getting lessons this summer. Safety rules and sunscreen is a must! Good that you’re making sure your daughter know the basics that are almost always forgotten – sunscreen and hydration! Water safety is so so so important. We’re about to start swim lessons for my son so I need to get some swim gear for him. I was planning on taking lessons this spring, but then I got pregnant. Holding it off until next Spring, I guess. Water safety is so important. This reminds me that I need to get my kids swimming lessons. That pool looks totally refreshing and fun. Pretty soon it’ll be pool/lake time here in Michigan! My son (3) loves the water and we just got him a new life jacket similar to the one you have pictured above. Hopefully this one will make him happy… the last one annoyed him because it came up around his neck all the time and he wouldn’t wear it. My girls don’t know how to swim yet, and so for now they are only allowed near water if they have their puddle jumpers on! I’m also really glad that they make them cute so that kids will find them appealing! I have Puddle Jumpers for both of my boys (almost 5 and 3) and will not let them near the water without them.. Water safety is so important to teach at a young age! What a beautiful family! Water safety is so important. My son is 5 and I really need to get him into lessons. We will be checking out those Puddle Jumpers. Water safety is so incredibly important. Although you always have to be careful, when both my kids became good swimmers it was like the weight of the world lifted. It’s good to be reminded EVERY summer about water safety! Thank you! Water safety is so important! I love the looks of those and will be checking them out as I need something for my five year old. My kids love the pool in the summer and I agree that pool safety is very important. We make sure to always be extra aware when near water. Water safety is so important. I also think it’s important to note that if, god forbid, someone falls into water that they need to be taken to the ER, no matter what. Secondary drowning is just as dangerous, especially in children.